Neil Giles has presented his lifetime's work and research in the runic tradition with a deep, meaningful and multi-layered treatment. I have had the privilege of hearing Neil Giles speak in public, and his book is written in a style that makes you feel you are attending his instruction in person. "Odin's Runes" explains firstly the runic tradition and marries it with mythology, gods, goddesses, symbology and Teutonic mysticism. The spirituality and magic come alive as you explore the keys to the meaning of the runes. The author unravels the keys for you with clarity and ease. 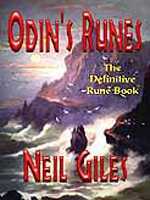 The language of the runes is explained with an in-depth, comprehensive meaning for each rune symbol. The graphics of each symbol are extremely clear and you are led on a journey of tradition, divination and discovery. I personally love the section on the interpretation of the runes, where all the gamut of life's experiences and layers of existence unfold. Each rune has its own life force and own energy, and the poetic and lyrical presentation of each one by the author gives them a powerful beauty that moves the soul. Open the book and you'll know what I mean. Again, on a personal note, I am passionate about language, linguistics and word meanings and origins. Neil unearths the finest detail about each rune symbol's definition and pronunciation, leading to the entity of the rune standing in its own powerful presence. "Odin's Runes" is a marriage of research, factual presentation, lyrical poetry, spirituality, love, mythical tradition and mysticism. This is a totally engrossing reference book as well as a trip down the lane of metaphysical discovery, written with passion and integrity.